We’ve already expounded on whether ZTE’s 5G Gigabit is in fact a phone (tl;dr it isn’t) but, after being told it would be on show on the company’s MWC 2017 stand we were keen to go along and not get to grips with it. The Gigabit was ensconced in a shiny clear plastic home, and the first surprise was that, viewed from the front, it gives every impression of being an actual phone. On closer inspection, however, including a bit of unsubtle peering underneath, you can see why ZTE’s executives were reluctant to say their phone was in a case – because the cabling is spilling out from underneath. Given that this is a phone that's prototyping tech rather than ever going on sale to the public, the aesthetic is arguably not all that important. But for the completists, the current iteration has a certain garage-built brutalist charm, with its visible screws, gaps around the screen and matt black scratched chassis. In terms of the pocket fit, the cabling could prove something of an issue, but if you've got the cachet of having the world’s fastest phone we think you could probably take the hit on that one, especially given the cheerful gold detailing on the cables themselves. Functionality-wise, the killer (and indeed probably the only) app is a triumph of simplicity, taking its task (prove that 5G is fast) very seriously and showing the numbers in a simple and effective readout. We believe the font may be Helvetica Light. 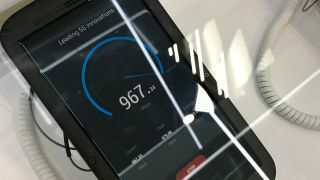 Joking aside, we’re taking it on trust that ZTE’s display is, indeed, showing us an accurate figure, and that the 'pre-5G' is up and operational. That’s actually an important feat – while there remains an argument about whether it's the first to achieve the landmark, ZTE has done something impressive. But we've asserted that this couldn’t really be considered a phone, and the appearance on-stand has done little to dissuade us of this opinion. By putting the kit in a case it makes it much harder to show that this is a functional device, and without a real-world illustration of the download actually doing something other than a speed test, this is merely a showcase of potential, and not even a prototype of substance.